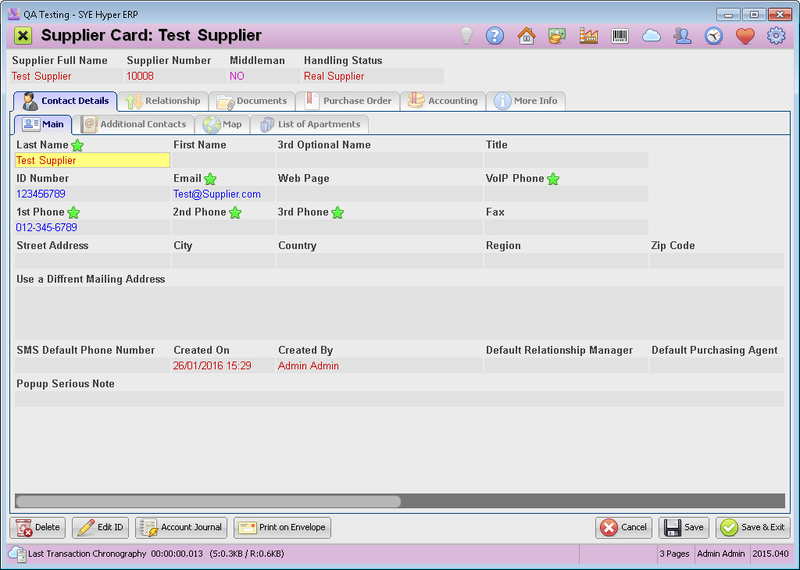 The supplier card contains all of the information about the supplier and his activity and relationship with the organization. This is the main tab of the Supplier card and displays the general details of the supplier, as well as additional related contacts. Contact Details - The main tab of the supplier card, as will be described below. Relationship. The relationship log of the supplier that includes meetings, phone calls, service tickets, SMS messages and audio recordings. For further information Click here. Documents - The related documents and files of the supplier. For further information Click here. Purchase Order - Create a new purchase order and view all of the previous orders of the supplier. For further information Click here. Accounting - The accounting rules of the supplier, commissions and invoices. For further information Click here. More Info - Additional customized information, according to the requirements of the organization. For further information Click here. Verify Address on Google In order to see the location of the supplier, fill in the exact address in the Main tab. The system will also display the GIS Latitude and Longitude.